The Low Head Maritime Museum is located in the historic Pilots’ Row, designed by John Lee Archer and situated at the Low Head Pilot Station, Low Head, Tasmania. The Parks and Wildlife Division of the Department of Primary Industry Water and the Environment is responsible for the Station. The Museum was founded by employees of the Port of Launceston Authority. They were Wayne Shipp, Nigel Haynes, Ian McLaren and Andre Gorjup. 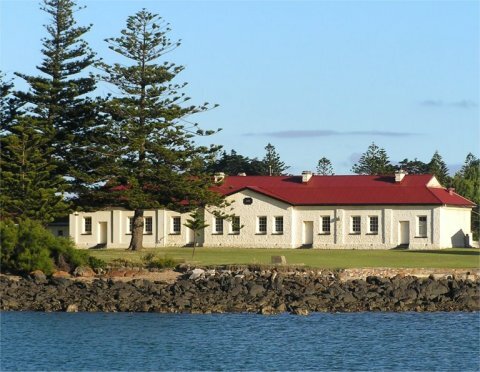 The museum is located in the historic convict built, John Lee Archer designed Pilots’ Row. John Lee Archer, an Irish architect trained in London, served as Van Diemen’s Land Architect and Civil Engineer for eleven years. He was also responsible for the first Low Head lighthouse. Pilots’ Row was built in 1835 as a terrace of four four-roomed cottages to house the Pilots. Built of local stone with some imported sandstone it’s original roof was clad in wooden shingles and had two gables. Opening Hours: 10 am until 4 pm daily except Xmas day. Entry into the Low Head Maritime Museum, Bass and Flinders Centre and the Watch House Museum in George Town. The displays on the wall tell the history of the pilot station. This is a good introduction to the museum. The station is the oldest continually operating pilot station in Australia dating from 1805. The map of the Tamar shows clearly the navigation channel. Although the river is quite wide, the navigation channel is narrow and winds from shore to shore. The channel is quite dangerous, containing reefs and rocks. In addition the current is quite strong. From the start, pilots were needed to guide ships past the dangers in the river. This room mainly contains information on whaling and sealing. Sealing in Bass Stait dates from 1798 and whaling from the 1820s. By Whilethe 1830s whaling was a very important industry for Launceston. While there were not many whales in Bass Strait, the Launceston based whalers established here stations on the West Coast of Victoria and on Kangaroo Island. This led to the first settlement of Victoria, at Portland and Port Fairy, before the founding of Melbourne. Note the harpoon and killing lance on one wall, and the try pot for boiling down the blubber. This room also has small displays on the marine life of Low Head and of the wreck of the Iron Baron in July 1995. Bunker oil from this ore carrier got among the penguin colony here, resulting in a massive rescue and clean-up operation. This room shows how the pilot was taken out to the ship by whaleboat, and had to climb up the ladder onto the ship. It also explains the Plimsoll line, introduced to prevent the overloading of ships. The LR means that the shipm is registered with Lloyds and the different lines represent different seasons, and freshwater as well as sea. This is because the density of water changes and a ship will float higher or lower depending on this. Images of pilot boats and the tug Wybia are also featured. In this room is the diving suit together with the compressor for pumping air down into the suit. Note the weights and heavy boots to make sure that the diver can stay down and not drift off with the current. The room also contains a line launching rocket and breeches buoy. There is a good diagram on the wall that explains it all. This room contains barometers, sextants, and various other instruments used for accurately marking on a chart and navigating a course. A sextant was used for measuring latitude and bearings from landmarks. The chart more clearly shows the navigation channel and the lead past Hebe Reef into the Tamar River. The lead is marked by the leading lights, the two white towers near Ainslie hospital. When these towers were lined up, the ship was in the channel leading into the river. Much of the equipment in this room came from the Ponrabbel II, a dredge that operated in the Tamar River from the 1920s until the 1960s. The Launceston Marine Board was determined that as many ships as possible should berth at wharves close to the city centre. Attempts to move the port further downstream were stoutly resisted. The Ponrabbel II was used to dredge the channel. There is also a good picture of the Loongana, launched in 1904. It was the first of the fast ferries across Bass Strait. Until the advent of the roll-on-roll-off car ferries in 1959, passenger ships across Bass Strait left from Launceston. The port even tried to have the ship berth at the bottom of Charles Street. That is how determined they wereto keep the wharves close to the city. When the tide was out, the Loongana had to sail early and anchor at Rosevears, and a tender transferred passengers arriving close to the scheduled sailing time to the Loongana. Eventually Kings Wharf was built to overcome the problem. This room contains cargoes salvaged from shipwrecks. The left hand section of the main cabinet contains items from the barque Asterope, wrecked 1883, while the centre section has items from the Eden Holme , wrecked 1907. The right section contains items from other shipwreck sites around Tasmania and particularly Flinders Island. In this room is a collection of river lights, signaling lanterns, ships’ navigation lights, and signal flags. Note the display board about Kathleen Cashion the girl signaler. The lights can be operated by pressing the button on the display case and a turn of the handle on the portable fog horn will produce quite a sound. A model Also of the semaphore mast used to send messages to Launceston between 1835-1858 is in this room. Also there is information on the electric telegraph that operated from this room in 1859-1861. Note the display of submarine telegraph and telephone cables 1859-1936. Also try your hand at sending Morse code. Our current exhibition is titled “Hebe Reef” and the display includes not only information on the reef but the navigation methods employed entering the Tamar River, the dangers involved and men who during history have charted the river. There is also a display of artifacts associated with navigation including the recently decommissioned Hebe Reef Light. This room displays how the ship was rigged. Different ropes were used for stabilizing the mast, climbing up the mast, raising and lowering the boom and raising and lowering sails. Above people's heads is a sea anchor. It operated in water on the same principle as a parachute. Note the knot board behind the door made by Bogdan Kolodziej and Helmet Schwabe. Note the working cannon still used occassionally for special events. The photographs on the wall are about holidays at Low Head. The artifacts in the case are mostly objects, which have been found around Low Head. One of the shackles is from an escapee with the shackle bashed into an oval shape so the prisoner could get his heel through the gap. The Cessation of Transportation medal is also a feature. This room features a shipwright’s tool chest once owned by well known Launceston woodworker Fred White, originally from Cumbria, England. Fred’s tools are displayed in the Blackwood drawer chests which have been kindly donated by Barbara Mary and Elizabeth Jill, daughters of Dr. and Mrs. F Rowland Tyson. Other exhibits feature tools and components used in the local Tamar River boat building industry. The Tamar River has a proud shipbuilding history dating over more than 200 years.